S&P500 has halted its one week of winning streak and shown massive sell-off on Friday on declining US 10 year yield. The index jumped more than 5% from low of 2720. US 3 month yield trades above US 10 year yield for the first time since 2007. It hits intraday low of 2785.40 and is currently trading around 2791.90. 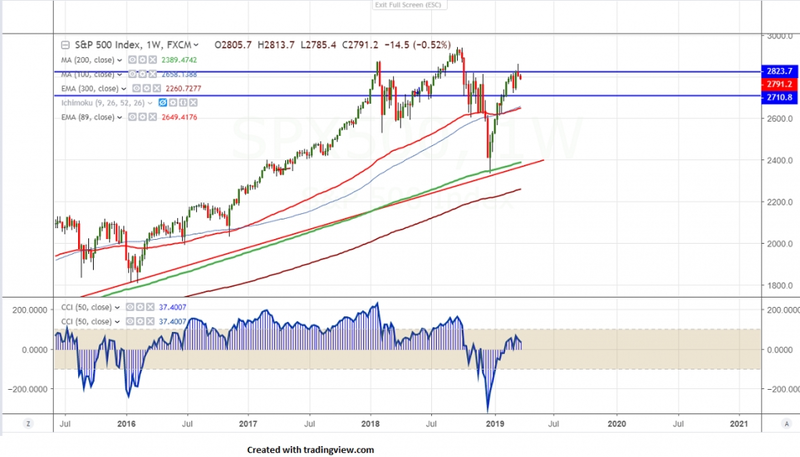 The near term support is around 2775 (61.8% fib) and any break below will take the index to next level till 2753 (200- day MA)/2720-30 (89- day EMA). Any break below 2720 confirms further weakness. On the lower side, resistance is at 2820 and any violation above targets 2840/2860. Any break above will take the index till 2900/2930. It is good to sell on rallies around 2815-20 with SL around 2840 for the TP of 2753/2720.